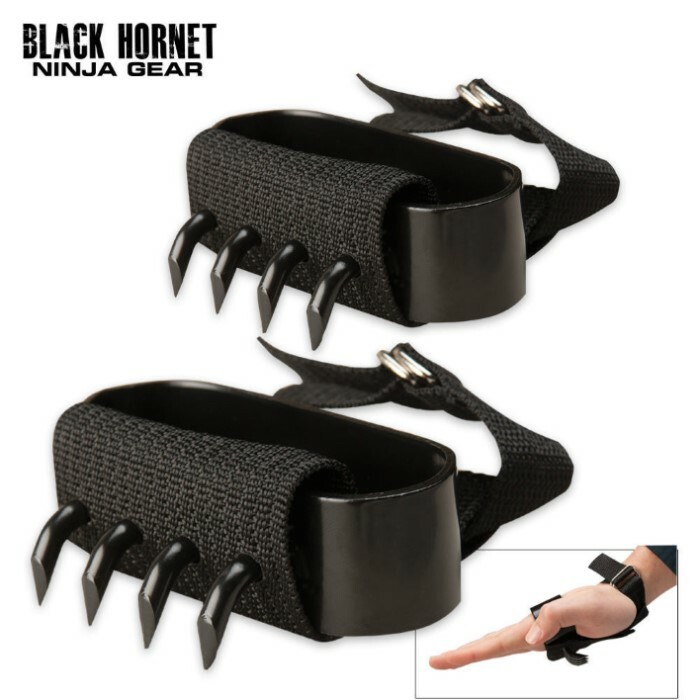 Traditional ninja claws are worn on the hands for climbing, ice walking, or self-defense. Heavy duty construction. Set of two. Combine with our Ninja Folding Grappling Hook and Ninja Foot Spikes for the ultimate scaling set. As a self defense weapon, the spikes would make it impossible to use in conjunction with other weapons (guns, knives, swords), and I wouldn`t want to rely solely on them for defense, as the other guy may have a gun, knife, sword. These are truly a quality product. The metal is good and the claws are sharp out of the box, though, with moderate use, they don't stay that way. The foot spikes are also a good thing to pair with this but a bunch of bad reviews have been posted because of a misunderstanding of proper use. 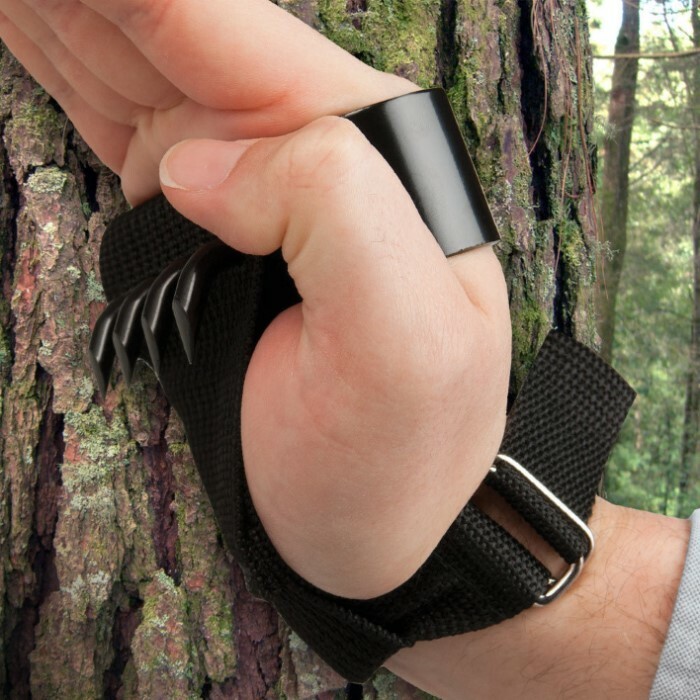 these are meant to be used in almost a bear hug around the tree or whatever, using the body weight to keep backward pressure on the spikes, and putting all of the strain on the wrist buckles rather than making the metal loop bite into the hand due to using them in a horizontal manner. same thing with the foot spikes, they are meant to be used in a squatting position with all the spikes lined up vertically and the body weight putting forward pressure onto the spikes. Anywho, thanks for sitting through that and I hope it helped. overall, good product, made even better with the foot spikes. 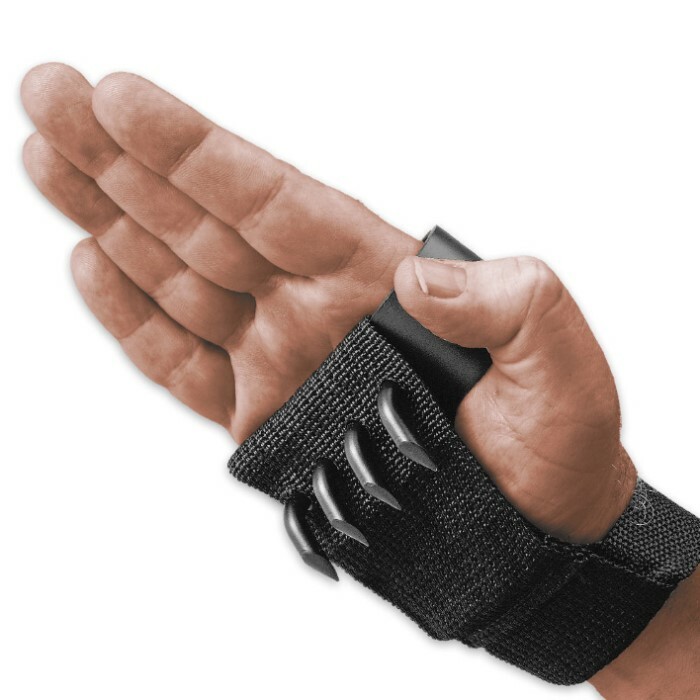 Long version: It's fairly simple, these claws are advertised to aid climbing and self defense. And after testing it I cannot imagine how this is supposed to be achieved. The claws will either press into the back of your hand as you pull down or slide off your hand if you press inward. I couldn't even get the claws to penetrate bark on four different trees much less stick into the wood. Even performing a strong slapping motion yielded little more than dashed hopes and me looking silly hitting a tree. Just wearing them removes your ability to grab branches, which is about 70% of tree climbing. The only reason I'm giving it 2 instead of 1 is because they are well built, just poor design for climbing. they work amazingly, but i recommend getting the ball bearing gloves with it as well so that you dont hurt your hands while climbing. very cool piece. cant quite climb with them all that well and straps are rather hard to get on by yourself. better for fighting than climbing. These were interesting. I wasn't able to climb very well partly because i don't also have the foot spikes, but they seem to do the job holding on to bark. Thick gloves are recommended especially for people like me who have thinner hands to avoid bruising. It seems like they would be more effective if the claws were a little bit less curved. For self defense however, I have no doubts that these claws would deliver. Not bad for the price. I didn't expect the metal to which the spikes are attached to go completely around- forming a thick band. This looks (and feels) incredibly uncomfortable and will most likely require some modifications. This metal band is very lose (and I have wide hands) though I have yet to test them out... hence the three star rating.